THE BIGGEST TOOL AND GADGET SET (39 PCS). 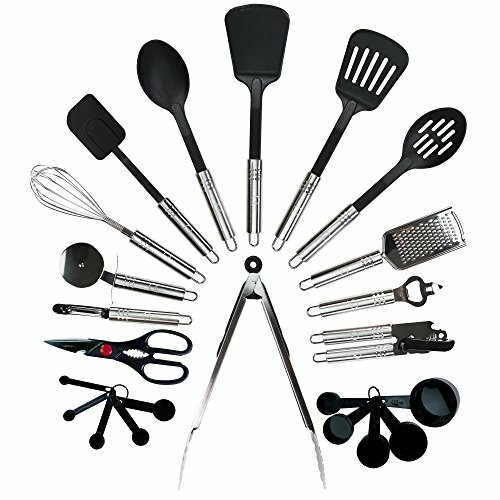 Cooking utensil set: Basting Spoon, Slotted Spoon, Slotted Turner, Spaghetti Server, Ladle, Oval Turner, Skimmer, Turner, Sauce Ladle, Whisk, Potato Masher, Icing Knife, Fork, Meat Fork, Big Chef Slotted TurnerChef Slotted Turner, Cooking Tongs, Pizza Cutter, Bottle Opener, Cheese Grater, Garlic press, Can Opener, Peeler, Kitchen Scissor, Ice cream spoon, Pie server, 3 Scraper Set, 5 Measuring Cups, 5 Measuring Spoons. 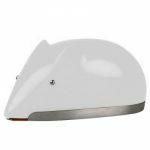 MADE OF NYLON AND HIGH-QUALITY POLISHED STAINLESS STEEL. Materials used in the cooking utensil set are eco-friendly and safe for your health. 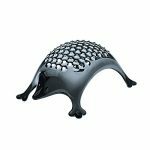 The tools don’t scratch dishes, but they cut, press, mix and do other things well – the highest-quality and most comfortable tools and gadgets to use. Cooking utensils for nonstick cookware set don’t have any smell, are easy to clean, can’t be stained with food, and withstand even high temperatures. 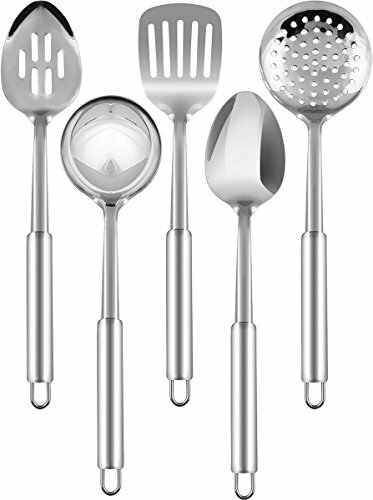 DELUXE KITCHEN STARTER SET: Stylish, easy to clean and durable for everyday use. Each piece is constructed from sturdy, durable Nyon and stainless steel components for great performance. NOTE: If you want to receive utensils fast, we suggest you to buy the package quantity 25pcs. ASIN: B01GHSBR2I Same quality as 38pcs utensils. NYLON UTENSILS (18Pcs) : Basting Spoon, Slotted Spoon, Slotted Turner, Spaghetti Server, Ladle, Oval Turner, Oval Slotted Turner, Skimmer, Turner, Sauce Ladle, Whisk, Potato Masher, Icing Knife, Bent Icing Knife, Fork, Meat Fork, Chef Slotted Turner, Cooking Tongs. NOTICE HERE: Nylon untensils heat resistant up to 400°F/ 210°C. EXTRA TOOL AND GADGET SET (20Pcs): Pizza Cutter, Bottle Opener, Cheese Grater, Flat Grater, Can Opener, Peeler, Kitchen Scissor, 3Pcs of Scrapers Set, 5Pcs Measuring Cups and 5Pcs Measuring Spoons. Measuring cup capacity: 1/8-cup, 1/4-cup, 1/3-cup, 1/2-cup and 1-cup and Measuring spoon capacity: 1/4-teaspoon, 1/2-teaspoon, 1-teaspoon, 1/2-tablespoon and 1-tablespoon. PRACTICALLY PERFECT – Practical tools for everyday use. Serving spoon, slotted turner spatula, serving turner spatula, spaghetti server, soup ladle, carving serving fork, utensil holder and organizer. 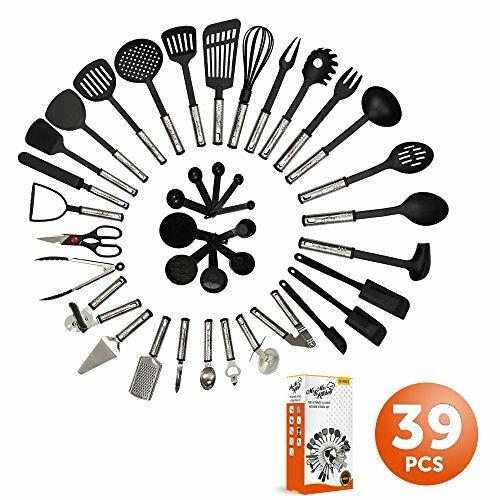 Everything is included in this amazing set of kitchen utensils to please anyone — whether they are a chef or anyone else preparing a meal for themselves or loved ones — this professional quality set of kitchen tools will fit the bill! LIFETIME USE – BEST stainless steel (most corrosion-resistant)–316 Stainless (also known as 18/10: this is steel that is 18 percent chromium, 10 percent nickel by mass). Stainless steel is the best quality for kitchen tools available. No rust or chipping. Lasts a lifetime! 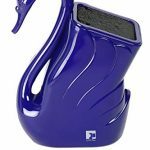 SAFE – Heat resistant handles allow you to grab each kitchen utensil without burning your palms. Dishwasher safe for easy cleanup every time you cook or bake. ★ EXTRA LARGE & EXTRA LONG 13.5″ = 30% BIGGER THAN OTHER SILICONE UTENSILS – Our customers told us size DOES matter, and we listened! These premium, heavy duty tools are exclusive to StarPack (patent pending), and are designed to take your cooking to the next level. Larger heads, deeper bowls, and longer handles mean greater control in the kitchen. ★ BEAUTIFUL, COMPLETE 6 PIECE SET FOR HOME COOKS: This attractive set combines all your essential kitchen utensils – a Turner Spatula, Spoonula, Pasta Fork, Serving/Mixing Spoon, Slotted Spoon, and Ladle. All available in 3 vibrant colors to match your kitchen decor. ★ HYGIENIC SOLID SILICONE DESIGN FOR EASE OF USE & CLEAN UP: There are no seams between the handles and heads for bacteria to grow, which means healthier cooking and less clean up required. With a steel core, ergonomically designed handles and the perfectly shaped heads, these are a pleasure to use. And StarPack’s premium non-stick silicone is literally the easiest substance to clean. Simply wipe under hot water or throw them in the dishwasher. 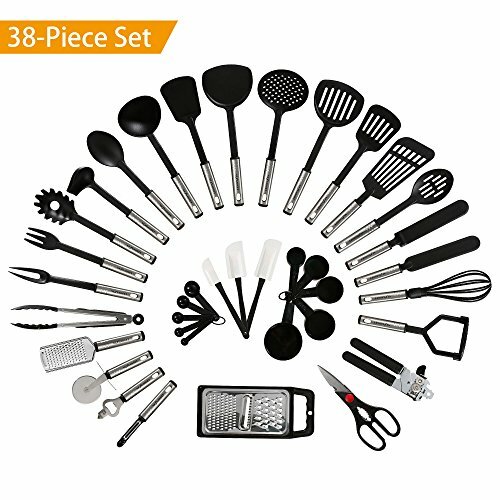 PERFECT SOLUTION FOR YOUR BAKING: 8 pcs Food grade Silicon Kitchen Utensil Set including Turner, Slotted spoon, Ladle, Spoon, Spoon Spatula, Spooula, Spatula and Basting brush. This versatile set has all the pieces you need for a variety of Baking task. It is a perfect solution for your kitchen. EASE OF USE: Ergonomically designed handles and the perfectly shaped heads,hanging loops on each end for easy storage. DESIGNED FOR DURABILITY & EASY CLEAN UP: With a steel core, ergonomically designed handles and the perfectly shaped heads, now there’s a silicone cooking utensil for every job. And premium non-stick silicone is literally the easiest substance to clean. Simply wipe under hot water or throw them in the dishwasher. BRILLIANT DESGIN, SPARKS INTEREST IN COOKING AND IMAGINATIVE – Our Windaze nessie ladle looks all manners of cute, making it a guaranteed source of novelty for anyone who wanders into the kitchen while the beef stew simmers. 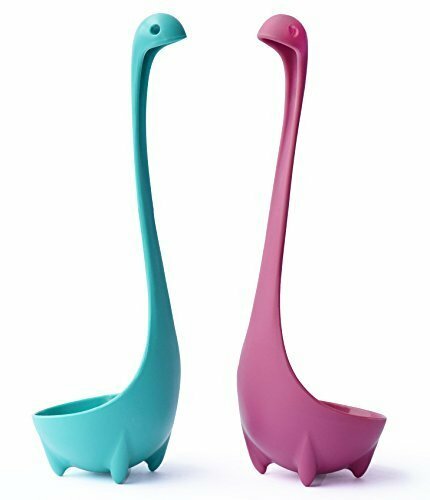 SELF-STANDING LADLE – Nessie’s cute design is also functional, with the creature’s set of stubby legs allowing the ladle to stand on its own without toppling over. When sitting inside your pot with its neck and head protruding through your delicious broccoli soup, it looks exactly like the Loch Ness Monster in the old black and white photo supposedly taken in Loch Ness Scotland in 1934. MADE FROM TOUGHENED NYLON, 100% FOOD SAFE – Windaze nessie ladle is made from 100% food grade nylon. Comparing to plastic, Nylon has better heat resistant, excellent chemical and wear resistant which means the ladle’s will not become brittle and the color will remain fresh even after years of usage.